Blue light, unlike Ultra Violet (UV) light, is part of the visible light spectrum. As with all light, blue light is given out by the sun and has a range of benefits. It actually helps us with visual and contrast acuity and as with all light, it helps us with our sleeping and waking cycles. Maintaining a good sleep/wake cycle optimises our memory, hormone balance and mood. Blue light can help alertness, reaction times and increase your sense of well-being. Our natural exposure to blue light varies; the average amount of blue light given off by the sun in the day is around 25-30%. However, with the increasing popularity of tablet devices, what can we expect when we think of the well-being of our eyes? Research has proven that nearly everyone now spends at least six hours per day staring at a screen of some sort, increasing our exposure to blue light. Other sources of blue light include energy efficient fluorescent bulbs and LED lights. Our eyes do have natural filters but they are not equipped to defend sufficiently against the blue light coming from the sun alone, never mind all the extra exposure presented in the form of screens and fluorescent lights. 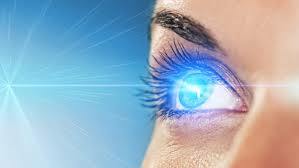 Blue light is one of the shortest, high energy wavelengths of light and as such reaches deeper into the eye. Due to this, it can cause damage to the retina and certain wavelengths are suggested to contribute to the development of age-related macular (AMD). The short, high energy wavelengths of the blue light cause a flickering effect and a glare. This could be one of the reasons behind eye-strain, headaches and both physical and mental fatigue. Digital eye strain has now taken over carpel tunnel syndrome as the number one complaint related to computers. The symptoms of digital eye strain include blurring vision, difficulty focusing, dry and irritated eyes, headaches and neck and back pain. These symptoms are not restricted to adults. A high percentage of children now own an electronic device in some form, but before the age of ten, a child’s eyes are not yet developed fully and exposure to blue light presents that much more of a risk. Time in front of screens for children should be limited for this reason. Looking at screens at night can present a whole other range of health risks, and has been linked to an increased risk to certain types of cancer including breast and prostate. Research suggests this may be due to the blue light reducing the production of melatonin (the sleep hormone) and the disruption of our sleep/wake cycle. E-Readers such as the Kindle Paperwhite may boast a low level of light but even these devices give off a percentage of blue light that can affect our eyes and our melatonin levels, increasing our risk of eye-strain, degenerative eye disorders such as AMD and sleep patterns. With ever increasing exposure to blue light, it is more important than ever for all of us, whatever age or occupation, to protect our eyes from the effects of blue light. Protection can come in the form of monitoring the amount of screen time we allow ourselves, filters, computer glasses with blue protection filter lenses with anti-reflective lenses. For more information about anything that this blog has raised, call our friendly team at Mark Davis Opticians on 01332 666 760 (Spondon), email spondon@markdavisoptician.co.uk or 01530 832 769 (Whitwick), email Whitwick@markdavisoptician.co.uk.